Nope, still cheap as dirt here. Hard to pay big bucks up here for a car that can be drove from March through October. Meaning no disrespect to anybody but as a 64 year old retired GM worker, I don't see the economy today anywhere near it was when I was starting out. The high paying factory jobs are not there anymore. A middle class guy could make a good living from the late '60's to the late '90's. He could spend his money on cars that were on the bottom of the price scale, fix it up with plentiful parts that were still around and get back most of his investment. The guys who want the '80's car of their dreams don't have the cash for it. They are in their '40's early 50's and have been facing stagnant wages because of NAFTA, they probably got hit hard by the Great Recession, their kids are hitting college, etc. From what I see from various GM forums, most of these guy are lucky to scrape together a couple of grand on a rust bucket with high miles. They can only make band aid repairs in quite the opposite way my generation did. They dump a ton of money into it that they are never going to get back, even though they think that if they spend 20K repairing the rust bucket, they ought to get that back plus their initial investment. I am always thrilled to see these cars preserved but the "classic car" wave has been with the Baby Boom generation, not the Generation X guys. bought this 81 malibu about 7 years ago for 6 grand. thought i paid way too much but i liked it. 350 turbo 350 with the usual air stuff missing. low mileage and very nice and ran very good. since then i put in a crate motor and my built turbo 350 and have a 9 inch to install this summer. also have a built 2004r for it but undecided about installing it. it never stops,but its my retirement project and i love it. Well, I basically put my toys in 2 categories. Temps and keepers. Temps are either things that I pick up strictly to flip or things that I know from the onset that I'll just be enjoying temporarily but almost certainly passing along for something else later on. The temps are the things I look at as an investment. At the very minimum, I want to be able to brake even when I liquidate. Better yet if I make a couple bucks. Keepers are the things I don't ever plan to sell -- my widow's problem. These are the things that I really don't make budget concerns a priority. I just make them the way I want them. The only consideration toward value would be insurance related. At this point I would consider my Cutlass, my old pickup, and my Indian all keepers. There are also a couple other things that I haven't built yet that I plan to add to the keeper list. All the rest could be sold and not really missed. As for the OP's topic; No, I'm not really shocked about prices. Supply and demand. Sure, there are relatively few that are "collectible" in a ZL1 or Yenko sense but old cars always go up in value over time. I can see how there is a nostalgic component for guys my age too. Honestly, I probably never would have gone looking for a car like mine if it didn't have a family connection. I have wanted a Malibu since high school though, so I'd probably still be a Gbody owner either way. Now and then I see a really gorgeous G-body and my jaw drops. But usually it is a POS that somehow survived a penny-pinching owner. I think what makes our cars undesirable to most is the small motors and lack of performance/luxury models. Even the top-of-the-line models had a 305 or less and those were rare to begin with. So even finding a clean solid car means swapping in a decent engine just to get it up to our standards. When I bought my first G-body in '93 I was looking for another station wagon and A or G bodies were all that were available. 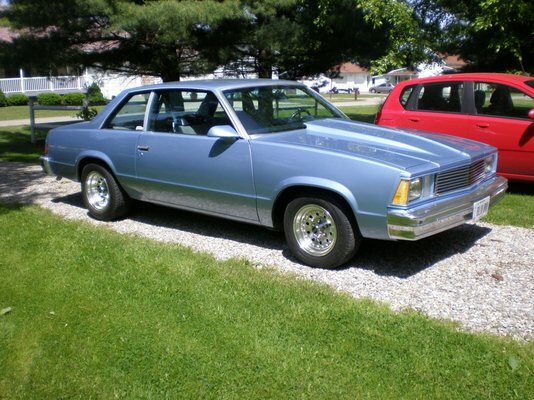 I found an '81 Malibu with the awful 229 and a 3 speed stick shift. I got it cheap ($300) because it was as base as you could get- no one wanted it. After sufferring with the 229 I immediatly swapped in a Pontiac 350. Someone else less capable would have dumped it just because of the 229- yuck. So our cars will not really get as valuable as we'd like in stock form unless tastes change dramatically. As with any generation, the guys/people with the money driving the prices buy what they like. This is usually the stuff they remember from their youth. The eighties are that time frame, these individuals are generating the income and spending it on this time frame of vehicles. They aren't making em any more, and supply/demand dictates the "value" as determined by the market. Those of us who have been "into" these gbodies for a long period remember when you couldn't get out and not see em everywhere . But just like the fox body mustangs they have disappeared from the daily driver status. Parts were everywhere and even a beater picked up for under $500 could generate profits after you picked off what you wanted/needed. These are the last of the mass produced rear wheel drive cars. And IMO why you see so many s10 trucks being hot rodded as they were produced into the ninties. But these are not seen like they were either. So, to summarize, prices are where they are, and the primo stuff always brings top dollar. There can be bargains out there but those barn finds are few and far between and even those can get caught up in the barret/jackson fever. I'm just glad the market is repopping sheet metal and other stuff for us. While we’re talking about El Caminos, the 1978–87 generation made the largest jump of any vehicle in the Top 25. Fueled by increased insurance activity and a rise in HPG values, the fifth-gen El Camino gained 25 points and leaped from 270th into a tie for 24th with 80 points. Newton wonders if it might be “because more people are starting to look at these as collectible rather than just used-up old pickups.” I knew the old girl had it in her. Got offered $20K for my El Camino the other day. I'm not tempted. roger1...I wouldn’t let that go for less than $40k. Mine’s not for sale. My “it’s not for sale” price is $100k. I’m not kidding. That’s what it would take to convince me to let go of it. The fact is the rise in price had to happen, they are the last of decent rear wheel drive vehicles that Joe blow can work on. A beater here is $1000 needs alot, a fixer upper is $2000 to $4000 needs engine, transmission or Alittle rust work, and a runner is holy ****! Your Camino looks worth that much and more. My neighbor bought an 84 two tone (brown & tan), bone stock camino with a push dent in the tailgate for $8500 about five years ago. He told me, "I probably paid too much but I don't know anything about fixing cars, it was in good shape and I have always wanted a camino." Hard to argue with that.